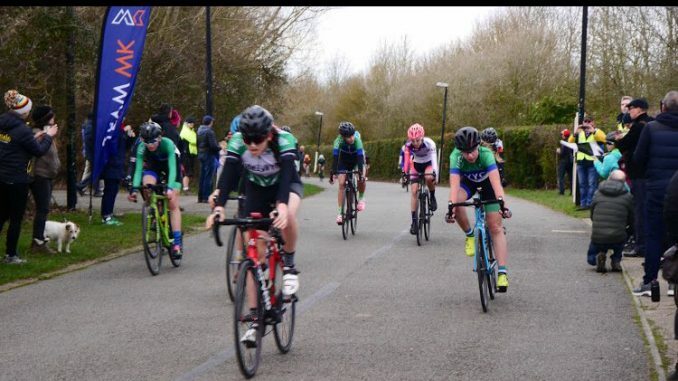 The road season is now properly underway and last Saturday (March 9th) the Welwyn Youth travelled to Milton Keynes for round one of the MK Bowl March Youth Criterium Series. Ella Coleman had the result she wanted, winning the U16 girls race in a sprint from a group of 7, while sister Millie took 10th place overall (4th U14) and Beth Bennett finished 24th overall (u14 place unknown). Iona Moir’s pedal came off (!) but she still managed to finish the race. In the U14 boys race Calum Moir had better fortune than his sister, finishing second, with Dylan Starkey 6th, Mark Lightfoot 9th and Ethan Storti 11th. Euan Woodliffe also took second place in the under 16 boys race with Joe Kiely 6th and Nathan Hardy 8th. In the U12 event we had Fin Woodliffe 3rd, Rupert Cavill 7th, Dillon Knott 10th and brother Xavier also finished 10th in the U10s, Elijah Storti came 7th. On the same day, Archie Peet was our sole entrant in the Spring Chicken road race near Buckingham – held on a pot-holed 13 mile course, this is a good race to use your training wheels on. Archie rolled in with the bunch in 34th place after striking all his matches attacking on the final hill. You can generally tell that the TT season is also properly underway by the absence of the word ‘hardriders’ from the event name. On Sunday 10th March, 6 grown up Welwyn testers teamed up in pairs for Lea Valley CC’s 25 mile 2-up TT on the rolling E1/25b course near Saffron Walden. With the wind gusting at over 40mph and roads swimming with water, Andrew Brown and Dave Scott claimed a fine 3rd place with 1:05:02, Oli Chapman and Dan Brockman came 5th while the pairing of Alison Hinds/Howard Ashmore battled against the worst of the conditions to take 12th – second placed out of the mixed pairings. Earlier in the day Keith Stockwell achieved 1:03:14 in the individual event, the 7th placed veteran getting an early 25 mile time registered for 2019 – clearly with one eye on Welwyn’s Rogers Cup now that son Oli (who won the event with 55:06) is racing for Ribble Pro Cycling.